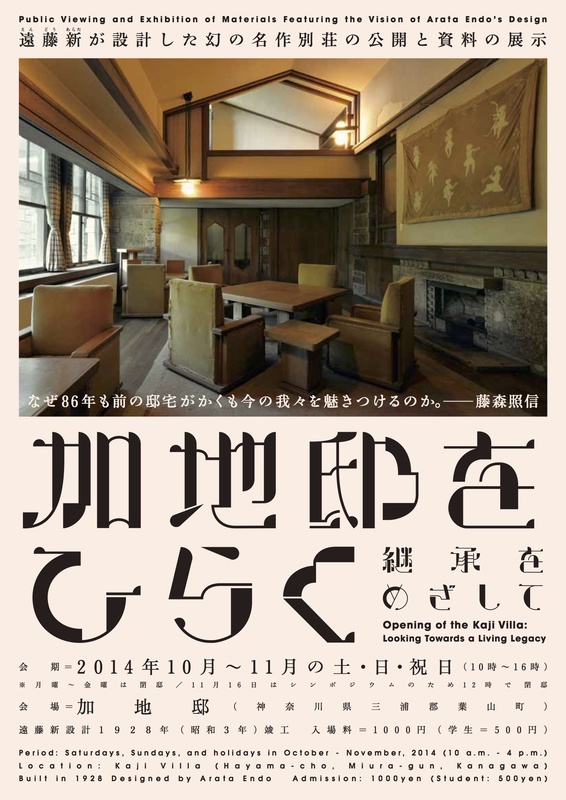 Hayama, Kanagawa, in conjunction with the villa’s first public opening. one of the actions to preserve the villa as a living legacy for the future. We hope you will take this opportunity to visit this landmark of Hayama. This entry was posted in Academic, Company News, Events, Heritage House Trust Events, Professional Development, Uncategorized and tagged Conservation, Events, Heritage House Trust. Bookmark the permalink. Congratulations with this great initiative! For more Iconic Houses, check out http://www.iconichouses.org! This is Juan Ordonez, architect at Community Housing Ltd.
My wife and I rented the Kaji Villa for two months in 1972 for the yen equivalent of $5500 a month. I was working for a US government agency, USN Task Force 157. It was much too big for us and difficult to heat. It did have central A/C because it was essentially a summer home that faced Sagami Bay. We moved out after only two months because it was too big for our family of three. We lived in Japan for a total of ten years and I learned to speak fluent Japanese. We were able to get out of the lease and moved into another western style with one Japanese tatami room nearby closer to Sagami bay. Thanks for your comment. I will pass it to the staff of Heritage Houses Trust. The house is still in use its preservation has been achieved. It is still an important landmark and one of the few remaining old houses in the area.